For the past couple of years, I have been participating in cookie exchange (see 2013, 2014, 2015, 2016) and I always look forward to it. This year, I am excited to join Sweetest Season Cookie Exchange (and help raise money for Cookies for Kids’ Cancer). I am super excited to share Holiday Shortbread Ghee Cookies with everyone. You guys, I have made this melt-in-your mouth cookies more than I want to tell you so put this Holiday Shortbread Ghee Cookies on your list asap. It's an egg-less recipe that calls for only 3 ingredients and so so good. Every holiday season, I try to incorporate something unique because I don't bake very often and I find it therapeutic to do this every now and then. This year, we are graduating from brown butter based cookies (brown butter chocolate chip cookies // brown butter cardamom cookies) to Holiday Shortbread Ghee Cookies. In case you are not familiar with ghee, it is a pure fat made by removing all the moisture from butter until the milk solids are caramelized then strained out. Ghee has a really nutty flavor and can be used in recipes that calls for butter or coconut oil. During ghee making process, milk solids and casein are removed so it is often tolerated well by individuals with lactose intolerance. However, If you have allergy/sensitivity to dairy and casein, avoid ghee. Ghee can be found at most Indian grocery stores & health food stores but you can easily make ghee at home. Here is a quick video if you are interested in making ghee at home. Use good quality, unsalted butter preferably grass fed. Now that we've talked about ghee, the most important ingredient in this recipe - everything else is breezy. We are going to mix ghee with powered sugar, flour, vanilla extract, and salt. I came across two different ratios used for classic shortbread cookies as 1:2:3 ratio of sugar: butter: flour and 1:1:1 ratio of sugar : butter : flour but I got better result with 1:2:3 ratio. 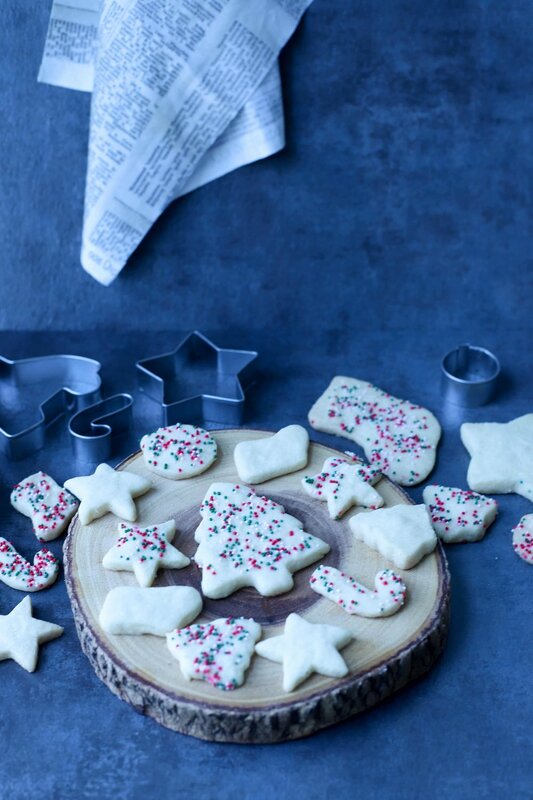 The key to melt-in-your mouth Holiday Shortbread Ghee Cookies is to work your dough quick! Preheat the oven, make sure your baking sheet is lined with parchment paper, and cookie cutters + sprinkles are on stand-by. See notes in the recipe below for more tips. I cannot wait for you guys to make Holiday Shortbread Ghee Cookies part of your baking agenda this holiday (and every holiday from now on)! If you are not into sprinkles, you can skip that (but why would you?) and keep things simple....or go all out by dipping them into melted chocolate. I'd absolutely love for you to tag @foodpleasurehealth on instagram if you make Holiday Shortbread Ghee Cookies! In a stand mixer or a handheld mixer, whip ghee and powdered sugar together for 8-10 minutes until it gets pale and fluffy. Gently add flour to the mixer and mix slowly. Scrapes sides and add vanilla extract, salt and mix until it forms a dough. The dough feels slightly sticky but should hold shape formed into a ball. Place the dough in a plastic wrap and flatten it into a rectangular shape about 1/4" thick. Refrigerate for 30 minutes or so. Preheat the oven to 350 F and set a baking sheet with parchment paper. Remove the dough from the refrigerator and work quickly. Use a cookie cutter to shape cookies and place it on a baking sheet. Bake for 6-8 minutes; they will be slightly soft when removed from the oven but will firm up. The dough is very soft to begin with so start by adding 3/4 cup flour and add more only if needed. The dough should form into a ball. Make sure to flatten the dough into rectangular shape about 1/4" thick. This way all you need to do is use a cookie cutter to shape your cookies. If making a large batch, make 2-3 different disk and work once disc at a time. Do not work the dough too much. Frozen, semi-frozen dough is the best. Don't forget to pin Holiday Shortbread Ghee Cookies!